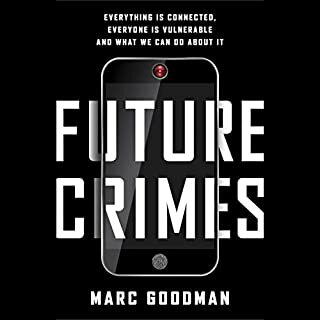 One of the world's leading authorities on global security, Marc Goodman takes listeners deep into the digital underground to expose the alarming ways criminals, corporations, and even countries are using new and emerging technologies against you - and how this makes everyone more vulnerable than ever imagined. I really enjoyed the book. Some of my peers thought the content was dry - others are really enjoying it. I read along while listening to book on Audible fond that to be very helpful. Some startling stories. Some must know info for parents and any social media or mobile users. I was aware of a lot of the content, perhaps not to the depth in some cases. I am a little shocked at how little awareness on most of the topics that some family and friends have. This book gave me some good conversation starters and has influenced my e-Behavior in a positive way.